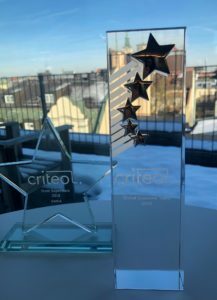 Solving customer problems has underpinned Irina’s career at Criteo, which has spanned a few different positions over the 6+ years she has been with the company. Irina is now part of the TVex team, which innovated when a problem came their way that couldn’t be addressed with the usual solutions. This week, Irina talks to us about the genesis of the combination of retargeting with TV advertising. I am from Russia but have been living in Germany for 10 years. I am now on the CSI team which is my third position here at Criteo. My first role was as an Account Strategist for the Russian market, then I moved to the DACH team as a Senior Account Strategist. What kinds of opportunities did Criteo present and how did you take advantage of them? When I was an Account Strategist on the DACH team, one of my clients asked me if we had any analysis of the relationship between retargeting and TV. We didn’t have any research like that, so I suggested that we work together to get the data we were interested in. The client shared their TV data for the whole year and our Analytics department analyzed it to find dependencies between TV and retargeting. Based on the findings, we created a case study together with the client showing how TV advertising and retargeting can work synergistically. What was the main challenge in TVex project? We started to brainstorm on a possible setup together with our Technical and Analytical departments to extend retargeting to TV. It was quite challenging because we had to learn about TV as a channel and create a new feature that would connect a retargeting campaign to a TV spot. At the beginning we used a local hack which was very time consuming. What was the game changing moment for TVex project? We presented our idea at a Criteo myidea event and the TVex team was not only chosen to present the idea, we also got first place and won the internal resources for product development! Thanks to the R&D resources, we could improve our solution and reduce workload for us and our clients. We are testing the solution now with several clients and making improvements. I hope one day TVex will become an official Criteo product. What was the key to success? The most important factor was team work! The joint effort made by the whole team and the combination of different strengths made everything happen. In addition, it was key to success that the local management team supported us from the beginning, and that we got the chance to present at myidea. I love running and am currently training for a half marathon that will take place this Spring. When I’m not logging miles, I enjoy reading and traveling. Lastly, any advice for people looking to build a similar career? Don’t give up and try new things, even if they sound crazy!